GUADALAJARA, JALISCO, MEXICO / ACCESSWIRE / November 5, 2018 / Grupo Aeroportuario del Pacifico, S.A.B. de C.V., (NYSE: PAC; BMV: GAP) ('the Company' or 'GAP') announced preliminary terminal passenger traffic figures for the month of October 2018, compared to traffic figures for October 2017. During October 2018, total terminal passengers increased by 10.3% at the Company's 13 airports, compared to the same period of the previous year. Domestic passenger traffic increased by 12.6%, while international passenger traffic increased by 6.5%. Seats and Load Factors: In October 2018, GAP registered an 11.1% increase in the number of seats available compared to October 2017. 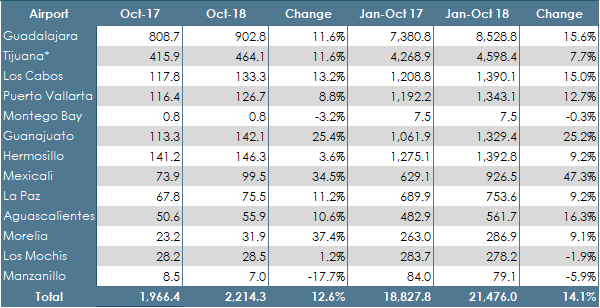 Load factors for the month decreased by 0.5 percentage points, from 81.5% in October 2017 to 81.0% in October 2018. Hurricane Willa: As a result of the hurricane passing through the coastal regions of Jalisco and Nayarit, 28 commercial flights were cancelled during the days of October 22, 23 and 24 at the Puerto Vallarta Airport. These cancellations represented a traffic decrease of 1.2%. 23 new routes are scheduled to begin operations in November and December, of which 12 are domestic routes and 11 are international. Grupo Aeroportuario del Pacífico, S.A.B. de C.V. (GAP) operates 12 airports throughout Mexico's Pacific region, including the major cities of Guadalajara and Tijuana, the four tourist destinations of Puerto Vallarta, Los Cabos, La Paz and Manzanillo, and six other mid-sized cities: Hermosillo, Guanajuato, Morelia, Aguascalientes, Mexicali and Los Mochis. In February 2006, GAP's shares were listed on the New York Stock Exchange under the ticker symbol 'PAC'and on the Mexican Stock Exchange under the ticker symbol 'GAP'. In April 2015, GAP acquired 100% of Desarrollo de Concesiones Aeroportuarias, S.L., which owns a majority stake in MBJ Airports Limited, a company operating Sangster International Airport in Montego Bay, Jamaica. This press release may contain forward-looking statements. These statements are statements that are not historical facts, and are based on management's current view and estimates of future economic circumstances, industry conditions, company performance and financial results. The words 'anticipates', 'believes', 'estimates', 'expects', 'plans'and similar expressions, as they relate to the company, are intended to identify forward-looking statements. Statements regarding the declaration or payment of dividends, the implementation of principal operating and financing strategies and capital expenditure plans, the direction of future operations and the factors or trends affecting financial condition, liquidity or results of operations are examples of forward-looking statements. Such statements reflect the current views of management and are subject to a number of risks and uncertainties. There is no guarantee that the expected events, trends or results will actually occur. The statements are based on many assumptions and factors, including general economic and market conditions, industry conditions, and operating factors. Any changes in such assumptions or factors could cause actual results to differ materially from current expectations. In accordance with Section 806 of the Sarbanes-Oxley Act of 2002 and article 42 of the 'Ley del Mercado de Valores', GAP has implemented a 'whistleblower' program, which allows complainants to anonymously and confidentially report suspected activities that may involve criminal conduct or violations. The telephone number in Mexico, facilitated by a third party that is in charge of collecting these complaints, is 01 800 563 00 47. The web site is www.lineadedenuncia.com/gap. GAP's Audit Committee will be notified of all complaints for immediate investigation.